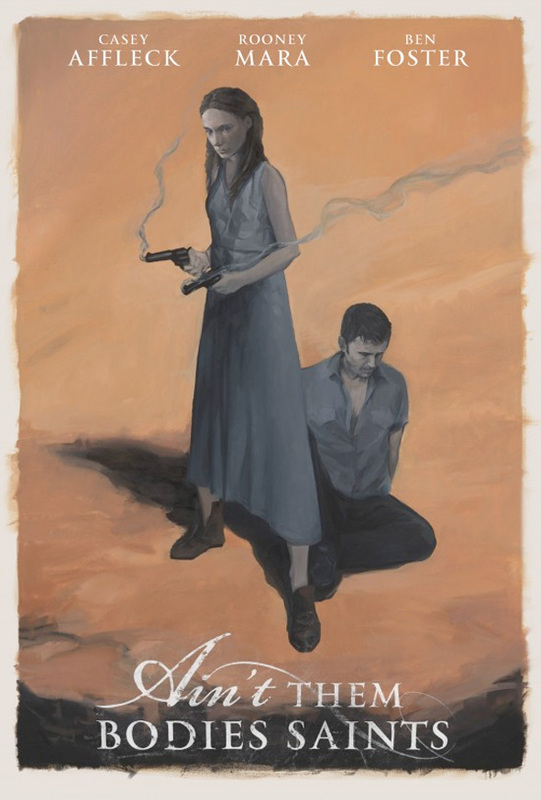 After debuting at the 2013 Sundance Film Festival earlier this year, IFC Films picked up Ain't Them Bodies Saints, the western thriller from writer director David Lowery, and it arrives later this summer. The film won the U.S. Dramatic Cinematography Award, and this writer called the film "a contemporary western with all the right beats, this film is full of authentic drama, and a respect for westerns of the past and present." Now a cool teaser poster has surfaced that looks more like an illustrated cover of a book featuring Rooney Mara and Casey Affleck. Hopefully there's a trailer coming sometime soon as well. Set against the backdrop of 1970′s Texas Hill Country, Ain't Them Bodies Saints is a romantic American story that follows three characters on various sides of the law – outlaw Bob Muldoon (Casey Affleck), his wife Ruth Guthrie (Rooney Mara), and a local sheriff named Patrick Wheeler (Ben Foster), who gets caught in their crosshairs. The film marks the second feature from writer and director David Lowery and was developed at the Sundance Institute’s Writing and Producing Labs and also features Nate Parker and Keith Carradine. IFC Films bought the film from Sundance and it hits limited theaters on August 16th. Well? This is those kind of movies that i always dream about it. This is MUST SEE for me. RARE DIAMOND. Seeing such movies is not usual nowadays. Sometimes , after seeing one movie , something CATCHING FIRE inside me. I think Ain't Them Bodies Saints have potential to be A MATCH for that again.